We all know that David Beckham is fiercely loyal to his family, and the model and football legend continues to show us time and time again how much he loves his wife and kids by going under the needle for tattoos dedicated to the most important people in his life. Less than a week after Victoria Beckham posted a photo of David’s rose neck tattoo tribute to Harper on Instagram, the proud father of four went back to the tattoo shop for TWO new tattoos – one commemorating his daughter’s artistic abilities, and another showing just how much David’s three sons look up to their dad. First, Victoria Beckham took to Instagram on October 28, to show off a precious new tattoo on the inside of David’s hand that was obviously designed by the couple’s four-year-old daughter, Harper. 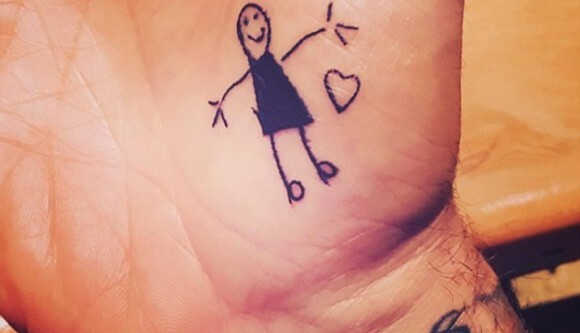 David Beckham’s tattoo features an image of a little girl with stick figure arms and legs, wearing a triangle-shaped dress. The tattoo of Harper’s drawing is inked in black on the palm of David’s right hand, and in Victoria’s Instagram pic, you can see the new ink is located just above the model’s Roman numeral tattoo on his wrist. David also shared a photo of his hand tattoo on Instagram, but in his picture, there is also a small outline of a heart inked next to the little girl. David has been doting on little Harper quite a bit lately, and the 40-year-old recently revealed two new tattoos dedicated to the four-year-old: a “Pretty Lady” tattoo and a rose tat, both inked on the left side of his neck. Harper isn’t the only one getting affection from dear old Dad in the form of ink though. David also recently showed off a tattoo on the other side of his neck of the word “Buster,” which is a nickname of his eldest son, Brooklyn. David didn’t stop there though; just hours after debuting his hand tattoo of Harper’s drawing, the soccer star showed off another new tattoo, this one designed by his sons. In another photo uploaded to Instagram on October 28, you can see David Beckham is sporting a new tattoo on his left ribcage of the phrase “We love you Daddy,” which was apparently written out by his sons, Brooklyn, Romeo and Cruz. David captioned the picture of his new side tattoo, “The boys expressing how they feel about daddy.” This is obviously one tight-knit family folks, but if David Beckham goes under the needle for a new tattoo every time he’s feeling sentimental about his family, he’s going to run out of room right quick. Still, we love his family-inspired tattoos…don’t you? ?